Prenatal supplements help provide essential nutrients for both mom and baby during pregnancy and breastfeeding, specifically folate which required for growth and development of the fetus. 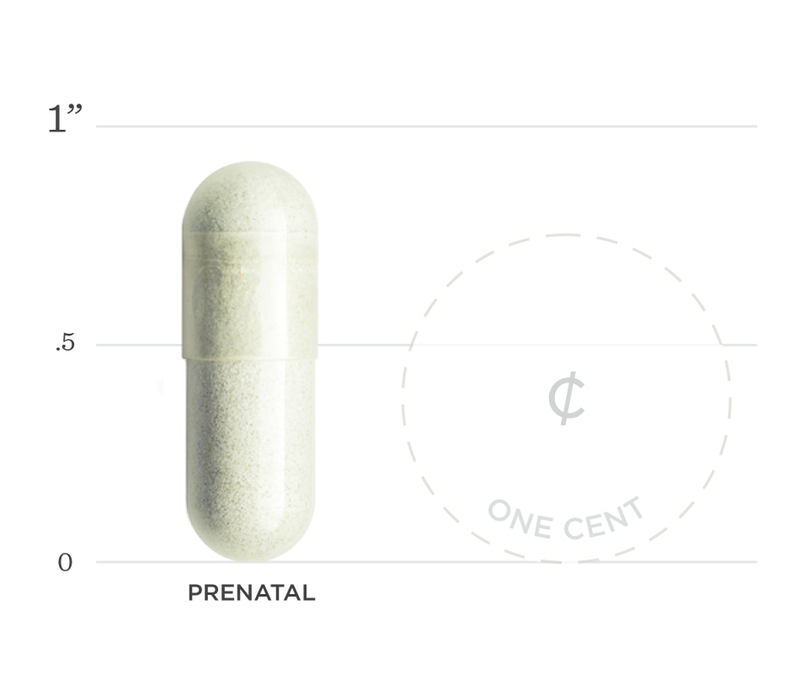 Prenatal supplements can be thought of as a 'super multivitamin'. Our prenatal supports increased nutrient needs during pregnancy which is a fragile time for baby development. Our Prenatal Multi focuses on the active form of folate, 5-MTHF, iron, and calcium, which are keys to a healthy pregnancy. Folate has been shown to help promote growth of a healthy baby, iron assists in building new blood, and calcium may prevent loss of bone density for the mother. 1. Greenberg JA, Bell SJ, Guan Y, Yu YH. Folic Acid supplementation and pregnancy: more than just neural tube defect prevention. Rev Obstet Gynecol. 2011;4(2):52-9. 2. Tayupova IM. [To the question of rational nutrition, micronutrient status correction, prevention and treatment of iron deficiency in pregnancy]. Vopr Pitan. 2015;84(2):25-33. 3. Kominiarek MA, Rajan P. Nutrition Recommendations in Pregnancy and Lactation. Med Clin North Am. 2016;100(6):1199-1215. Below we've broken down the main functions of our Prenatal and the benefits it can provide. Micronutrient demands increase during pregnancy, especially folate which is required for growth and development of the fetus. Supplementation with prenatal supplements containing folate has been shown to help prevent neural tube and congenital heart defects. Iron needs increase during pregnancy as blood volume increases and is essential for oxygen delivery during pregnancy. Breastfeeding requires additional energy and micronutrients to provide for both mom and baby. Magnesium, vitamin B6, folate, calcium, and zinc needs are all increased as well as fat and water soluble vitamins passed onto baby through breastmilk. Prenatal supplements can help prevent nutrient gaps and maintain milk supply.